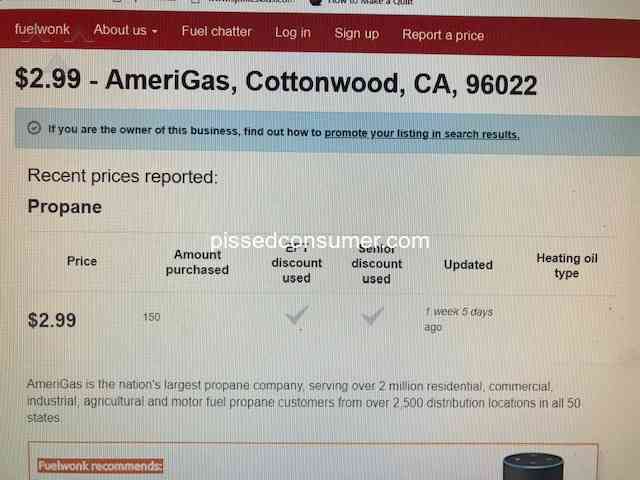 I had America gas and when I called to ask why I was being charged so much. Cause I’m disabled & on a fixed income. Also was on the budget plan. The women who answered asked if she could call me back. In which she called me on her private cell number. She then informed me that customers on budget plans were completely being taken advantage of cause there bill does not show the price per gallon. She had be instructed by management to do so. She instructed me to switch companies. This should be illegal. I switched companies the same day. I’m greatful for someone putting her job on the line to do the right thing. Amerigas - Read the other reviews! 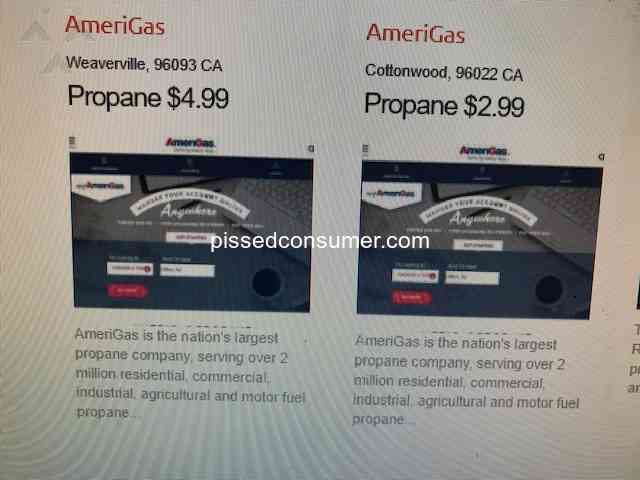 No one has anything good to say about AMERIGAS, and just getting prices to start service was enough to get me to move over to Ferrellgas. At Amerigas, you have to use a tank of at least 120 gallons, and, for $500 they would be happy to install theirs -- which you then lease. I found a much better deal elsewhere, THEN read these reviews. I'm very glad I went with Ferrellgas! !st: gave me a tank with a broken gauge and then charged me and extra fee when we ran out of gas, even though they had to replace the tank and gauge. They take 5 business days to come fill your tank, even when you tell them you are low. Paid for 96 gallons in advance. Told them my tank was completely empty (thus the 96 gallons because that's all it will hold). Was asked twice by the rep if the tank was empty...yes, we told them twice. 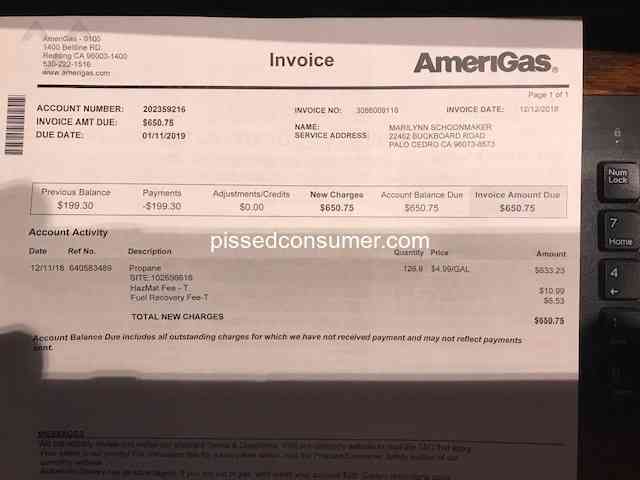 We paid in advance over $350 and then got a bill for an additional $65.00. Tried to talk with Keona (?) about it. No luck. Current manager Joel, treats his driver's and receptionist like he is better then them, not to mention customers, smells like booze. yells and comes to Receptionist desk demanding her to fix what ever he needed done, seeing the phones ringing and had customers at her desk. The little lady always had a smile on her face, although embarrassed, would always apologize for the jerk. Kudos to her for holding it together. Drivers, serviceman overworked. Haven't seen the little lady in there for over a month. Glad she got away from the jerk. Drivers, serviceman they can't pay your enough to take that abuse. Embarrassed for the Casper/Douglas offices. I was unaware that the Springfield Amerigas had closed, they were very efficient. When I called the Springfield number I was connected to someone in Gallatin, TN, that said she had to e-mail someone in Red Boiling Springs, TN to get me on a list for a gas delivery, because they just have two trucks that cover Robertson, and sumner and Montgomery counties. This is ridiculous. I was told by the lady in Gallatin, I should call when my tank is 30%, I never had to do that when the Springfield office was opened. By the way what happened to the Springfield office?